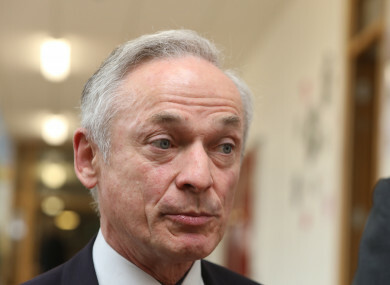 MINISTER FOR COMMUNICATIONS Richard Bruton told the Dáil this evening that tweets that had been attributed to the programme director for the National Broadband Plan (NBP) “should not have happened”. Bruton was facing questions tonight over the plan following a recent audit of the procurement process which found that neither former minister Denis Naughten nor businessman David McCourt had an influence on the process. In October, Naughten resigned as Minister for Communications, Climate Action and Environment after it emerged he had a number of meetings, including private dinners, with businessman McCourt outside of the procurement process. The issue of the tweets was raised by Fianna Fáil’s Timmy Dooley in the Dáil chamber. The Sunday Business Post had tweeted a screenshot of an article about the audit conducted by Peter Smyth. In response, a tweet from an account bearing the name Fergal Mulligan – the name of the man who is programme director for NBP – was posted. Dooley told the Dáil: “It has been reported that the programme director for the NBP tweeted this weekend, in response to an article posted by the Sunday Business Post: ‘A decision on the only game in town will hopefully be made in the next couple of weeks’. The Fianna Fáil TD asked Bruton if the tweet came from the programme director and, if so, if he believed it was appropriate for Mulligan to “engage in this kind of communication at this stage of the process”. In response, Bruton said: “Finally, I acknowledge that tweets were sent which were attributed to the director of the programme. This should not have happened and will not happen in the future. All engagement with the media will be managed through the press office. The individual concerned has been very passionate and energetic in developing the project. That is fair. The recently-appointed minister added that he wants the procurement process for the plan to conclude “in a fair and transparent manner”. The minister was pressed a number of times on the finding of the audit which found no influence had been exerted on the process by Naughten. “If there was more than one bidder the Minister knows that its lawyers would be down in the courts now arguing that the remaining bidder, which has clearly breached canvassing rules, should be excluded from the process,” Dooley said. In a statement this evening, Sinn Féin’s communications spokesperson Brian Stanley said questions still remain around the viability of the broadband plan. “What is very clear from the report last week and number of meetings, is the informality and the close relationship Government has to big business,” he said. Email “Bruton says tweets attributed to broadband plan director 'should not have happened'”. Feedback on “Bruton says tweets attributed to broadband plan director 'should not have happened'”.